Welcome Home! Come stay in our magnificent converted Colombian Villa in El Rodadero the safest barrio of Santa Marta and only minutes walk to 3 of Santa Marta's best beaches. Named in Hostelworld's best Hostels of Colombia 2018! Relax by the pool, meet other travellers and have a fun night out with Santa Marta's best bars and restaurants nearby . The story goes that the Villa was once owned by a cartel before being abandoned and later turned into the stunning Hostel it is today. Come and experience our truly unique hostel. Beside being super clean and organised, our priority is our friendly service. Looking to do Ciudad Perdida, Minca, or Parque Tayrona? We got you covered and can book it all. Need info to get to the next destination, let us give you all best info to do it on your own with transport or a tour. Free luggage storage means you can have piece of mind when you want to head off for a couple of days. When you come back why not unwind and have massage with a glass of wine by our stunning pool in the afternoon. Or take advatage of our nightly social calender set up by our cute pool side bar where you can watch movies above the pool whilst sipping on our 2 for 1 happy hour cocktails. 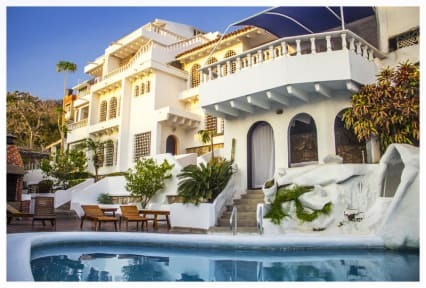 Once the party gets going, we have connections to Santa Marta's best bars and clubs and get you to the dance floor quicker :) When you comeback you know you will sleep well with air conditioning in all our dorms along with curtains, power sockets and mini lights. The hostel is only a 3 minutes walk from the beach, 2-3 minutes walk to all the major supermarkets and only 10 minutes bus ride from Santa Marta historical centre. The airport is only 20 minutes away ($cop 20.000 fix price with taxi). The beach in El Rodadero is much nicer than the one in the center (where there is an industrial port). Within walking distance you will find supermarkets, banks, atm, restaurants, cinema, bars and souvenirs. You will sleep well: all our dormitory beds have air conditioning, privacy curtains, an individual light, plug socket, shelf and lockers. As for the private rooms, they are all different so you can choose from a small single room to a large master bedroom with your own balcony over the garden. Most our guests use the hostel as their home-base to explore nearby attractions such as Tayrona Park, the Lost City, Minca, Palomino or la Guajira. You can travel light and return to rest after exploring around: not only we store your bags for free but we have all the answers to your questions and can book tours and transports for you. 19% IVA will be charged to Colombian upon check-in. Foreigners do not pay IVA taxes, as per colombian law. Guests are welcome to store their luggage and use common spaces before and after their stay. The first night will be charged if cancelled after this time. Late check-in without reservation not allowed past midnight. Day guest must register with ID and are authorized in common spaces until 9pm and for $ 10 000. Small economy room, shared bathroom, single bed, a/c. Small economy room, shared bathroom, double bunk bed, a/c. 6 bed mixed dorm: ac , ensuite bathroom, privacy curtains, light, power outlet, locker. 8 bed mixed dorm: ac, en-suite bathroom, privacy curtains, light, power outlet, locker. 10 bed mixed dorm: ac, 2 ensuite bathrooms, privacy curtains, light, power outlet, locker. Fans, ensuite bathroom, double bed, safe box. A/c, ensuite bathroom, double bed, safe box. As we walked in, we were greeted with open arms. They offered us drinks and checked us in. This place has a grrat atmosphere. The manager organized games in the evening and that created a good vibe. We had a private room with a balcony facing the pool. Everything was clean and things were quiet after 11. We had a good night sleep. One of the best hostels I’ve stayed in. The hostel is beautiful and the staff is more than amazing. Would definitely go back ! A really great hostel!! Staff are super friendly and will help you with anything! Beautiful building with a pool and very well stocked kitchen. Also try the food they serve, it is amazing. Would 100% recommend! Awsome hostel!! I book 2 day's end up staying for one weeks at Calle 11! The staff was amazing, really chill hostel and has and awsome pool. This place was really good. It's run by an aussie and his helpful staff. It's not really a party hostel but still has a great atmosphere and it was really easy to meet people. great place to stay. very clean and well orginized. Awesome hostel. Highly recommend. Beds have curtains and outlets! Good view of the city on the roof. One downside, it needs more bathrooms. A super relaxed spot that feels like hanging out at your house in summer time. Staff and super welcoming, friendly and always happy to help. Close to the local beach and a short taxi drive to Santa Marta. Ultimately, an awesome chill-out and hang-out hostel filled with friendly faces!